Jordan Josey is an associate attorney at the McArthur Law Firm. Originally from the upstate of South Carolina, Jordan graduated from Clemson University with a degree in Communication Studies. While in college, Jordan was involved with the William T. Howell Pre-Law Society Mock Trial program, earning an award for best attorney during his senior year. Jordan attended Mercer University's Walter F. George School of Law. There, he was selected by the faculty to serve on the Mecer Advocacy Council as a competitor on two national moot court teams. Before graduation, Jordan earned the Guerry R. Moore Insurance Award and the CALI Award for Excellence for the highest performance in his Insurance Litigation course at Mercer. Jordan was also inducted into the Order of the Barristers, a national association recognizing excellence in the art of courtroom advocacy. 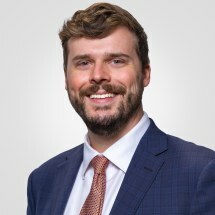 Jordan began clerking for the McArthur Law Firm during his second year of law school and developed a passion for insurance litigation and plaintiff's practice. He joined the McArthur Law Firm as an attorney after graduation. Since he joined the firm, Jordan has maintained a personal injury practice involving motor vehicle collisions, trucking collisions, premises liability, and workers’ compensation. Jordan lives in Macon with his wife, Virginia, who is also an attorney.